Wages function as an incentive to work. Edward P. Lazear explains “without compensation, the overwhelming majority of workers would not otherwise perform the tasks.” In this context, “incentives affect behaviour and that economics as a science has made good progress…of demonstrating that compensation, incentives, and productivity are inseparably linked”. Historically, wages were a reasonably stable benchmark of the price of labour. But the ability of wages to be representative of the price of labour has been disrupted by emergence of new work forms that operate on a variety of price mechanisms. In addition, the fragmentation of jobs into tasks, the unbundling of idle time and social protection costs, and demand-driven price volatility have reduced the comparability of the different labour prices. The disruption of labour markets poses significant measurement challenges and magnifies the gaps between theory and reality. For example, the new work forms may have increased the level of underemployment or caused understatement of wages. The biggest policy challenge is whether the existing theoretical models – labour monopsony, search costs, backward-bending supply – are sufficiently robust to analyse behaviours in the labour market and explain market failures. David Autor notes “the labour market depicted by undergraduate textbooks is a pure spot market with complete information and atomistic price-taking. Labour economists have long understood that this model is highly incomplete. Search is costly, information is typically imperfect and often asymmetric, firms are not always price takers, and atomistic actors are typically unable to resolve coordination and collective action failures”. The important trend to note is the shift from direct employment to the use of intermediaries in the labour market. David Autor suggests “in this second-best of all worlds, numerous third parties inevitably arise to respond to, and profit from, market imperfections…Labour Market Intermediaries – entities or institutions that interpose themselves between workers and firms to influence who is matched to whom, how work is accomplished, and how conflicts are resolved”. The re-emergence of labour market intermediaries “in an era of rapid information flows and substantial job mobility” suggests “cheap information alone is rarely sufficient to solve the failures endemic to labour markets. Redressing adverse selection and reversing coordination failures ultimately requires labour market institutions that can variously compel disclosure of hidden information, coordinate the actions of participants in a congested market, or solve collective action problems among parties with complementary interests. Despite widely heralded advances in the technology of job matching, I anticipate that labour market intermediaries will continue to address, ameliorate, and exploit the imperfect environment in which workers and employers interact.” The effect of intermediaries therefore can be assessed in terms of “costly information, adverse selection, and (failures of) coordination or collective action”. Arindrajit Dube, Jeff Jacobs, Suresh Naidu and Siddharth Suri also argue that “if online markets for data labour exhibit such extreme market power, it is perhaps unsurprising that many companies effectively pay zero wages for data they collect from users of their platforms”. This leads them to suggest the “possibility is that requesters are on the more elastic side of the crowdsourcing market. This would make it profitable for Amazon to provide a platform that enables the bulk of the surplus to be captured by employers rather than workers”. In labour markets where work is fragmented, the main culprit causing market failure may not be labour monopsony or search inefficiencies. Instead it is the strategic behaviour of firms in response to the choices provided by flexible work arrangements. In this regard, flexible work arrangements offer employers several advantages. First, the shift from an employment relationship to a market transaction results in the unbundling of benefits and the shifting of risks to workers. In this regard, flexibilization shifts the costs of idle time from employers to workers. Another way of thinking about this is that the “option value” of flexible work is captured by employers and intermediaries at the expense of workers. Hence, the transacted price of labour is comparatively cheaper than equivalent wages due to tremendous savings from the lower costs of non-price elements. Second, flexible work arrangements expand labour supply by making it feasible for individuals to work on a part-time basis. In an information-based demand-driven system, there is likely to be excess supply of labour, except during peak hours, which will drive price towards or below the marginal costs of labour. Third, the fragmentation of work increases production flexibility by shortening the time frame for work and by making “employment” more transactional. Firms have greater flexibility to choose when to use labour-based services within very short time frames. Hence, they could choose to use labour when labour costs are low and halt production when labour costs are unfavourable. In contrast, flexibility is costly to many workers, who tend to be passive price-takers, as they are dependent on the income and need to maximise usage of their time. The costs of waiting (for work) are thus more expensive for the worker as compared with the firm. Choice may not have been so important in the inflexible traditional employment regime, but choice is a critical factor in determining bargaining strength in flexible work markets. One interesting question is why intermediaries flourish when there is more information rather than less. In this context, intermediaries need information to achieve sufficient scale for their specialised service. Intermediation is thus a feature of a high-information environment characterised by networks and modularity that facilitate the cost-effective transformation of employment relationships into autonomous transactions. The expensive employment relationship can be unbundled into a series of transactions of work that may be completed by several intermediaries on relatively lower costs; a feature associated with vertical disintegration. If information is widely known, how are intermediaries able provide a cost-effective service to their customers and still make a profit? On the surface, intermediation seems to add additional layers of costs while the net monetary cost-benefits are indeterminate because prices are constantly changing. But the intangible benefits of interposing an intermediary between firms and workers is that it shields employers from the direct consequences (e.g. labour issues, non-compliance risks) and increases the flexibility on costs (which is difficult with in-house labour). In this regard, David Autor observes “participation in the activities of a given labour market intermediary is typically voluntary for one side of the market and compulsory for the other.” Since “information about job vacancies and job seekers is largely a public good and hence likely to be under-supplied by the market”, intermediaries can step in to encourage firms and workers to post their own information. In this regard, intermediaries can provide verification services to mitigate the risks that workers and firms could “shade adverse information to raise their wages or profitability” through “a mechanism that implicitly or explicitly compels market actors to disclose information that they would rather conceal”. Information thus increases the viability of intermediation, allowing intermediaries to quickly adjust prices to take advantage of demand and supply within short time frames to produce cost-effective outcomes for their customers. This suggests intermediaries ultimately make money by reducing labour costs of one group of customers (employers) at the expense of another group (workers). Intense competition among intermediaries (subcontractors, self-employed) can lead to bidding wars that put downward pressure on labour prices as well as result in shoddy practices. Hence, the markets for fragmented labour tend to be one-sided and employer-driven. This may not be that much different from monopsonic markets except that under traditional employment, wages are generally bundled with benefits and are relatively stable. This is not the case for market transactions where prices are volatile and the risks of volatility and social protection costs are almost completely borne by labour. The inability of workers to get favourable prices on markets reflects that information increases choice for employers and opportunities for intermediaries but at the expense of most workers. Price regulation (e.g. minimum and union-negotiated wages) are incompatible with an environment of on-demand pricing. Similarly, anti-trust initiatives and providing better information to reduce search costs are insufficient to restore labour bargaining power. In fragmented and volatile markets, the source of labour’s weakness is the lack of options for getting better prices. Hence, fragmented markets for labour should not be regulated the same way as traditional employment. In this regard, labour markets are undergoing the same experience as financial markets where information advances have provided the capability to “slice and dice” work or risks as the case may be. It then follows the best remedies may be found in the approach used to regulate financial markets. The objective of financial market regulation is to ensure the integrity of the price discovery process and that markets are fair and orderly to ensure that high levels of public confidence and trust. If market quality is poor, the market degenerates to the level of a bazaar where coordination failure occurs frequently due to information asymmetry and risk aversion. The mitigation of exploitative elements requires regulations to mitigate the private sector’s information advantage and to improve information transparency and worker choice. Labour regulators should therefore establish standards to ensure intermediated markets for labour are fair and transparent and that all participants are protected. In this regard, labour intermediaries and platforms can be licensed to subject them to oversight. Intermediaries and platforms should be obliged to report information relating to the treatment of workers and to ensure the terms of contracts are fair and properly disclosed. Intermediaries and platforms should also be encouraged to provide tools to help workers find better offers or jobs in line with their specifications. There should be guidelines to curb abuses (including those driven by algorithms) involving coercion, manipulation and discrimination. The regulators should be provided with the necessary powers to conduct inspections, impose fines or suspend activities and weed out low-quality operators. Overall, the shift from direct employer relationship-based pricing to the intermediated pricing of labour has been consequential. In the past, seniority-based wage increments have driven wage increases and underpinned social stability. But landscape disruption has forced businesses into greater use of flexible work. The new pricing mechanisms have engendered an environment of stagnating wages and rising profits, extended technologically-driven forms of precarity and induced a sense of social unfairness. Governments therefore need to fix the labour market with new regulatory frameworks for labour intermediation to improve labour market conditions and to ensure a better balance between social needs and profits. 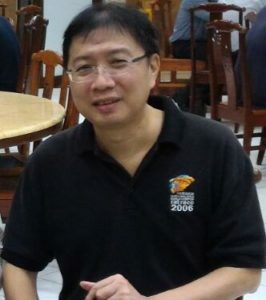 Phuah Eng Chye (11 November 2017) “The sharing economy: To deregulate or to reregulate.” Economicsofinformationsociety.com. Phuah Eng Chye (26 May 2018) “Labour share of income (Part 1: Theories and measurement)”. Economicsofinformationsociety.com. Phuah Eng Chye (2 June 2018) “Labour share of income (Part 2: The difficulty of overcoming wage stagnation)”. Economicsofinformationsociety.com. Phuah Eng Chye (9 June 2018) “Labour share of income (Part 3: Causes of wage inequality)”. Economicsofinformationsociety.com. Phuah Eng Chye (30 June 2018) “Labour share of income (Part 6: The missing big picture)”. Economicsofinformationsociety.com. Phuah Eng Chye (7 July 2018) “Labour share of income (Part 7: The respective roles of wages and profits)”. Economicsofinformationsociety.com. Phuah Eng Chye (14 July 2018) “Labour share of income (Part 8: – Wage regulation and information disruption)”. Economicsofinformationsociety.com. Phuah Eng Chye (25 August 2018) “Future of work: Challenges from the changing organisation of employment”. Economicsofinformationsociety.com. See Phuah Eng Chye on the labour share of income. Underemployment has been used to explain the co-existence of stagnant wages and full employment. Classifying flexible workers as self-employed may lead to understatement of wages or result in income data not being reported. Phuah Eng Chye “Labour share of income (Part 1: Theories and measurement)”. There are many examples of additional layers in financial markets and asset management. I was formerly a securities regulator and equities analyst. I started writing these articles (and a book) because I felt that there were a lot of economic theories that didn’t seem to match up to the realities we are facing. This also means that a lot of policies (based on these theories) are wrong. So I’ve tried to make sense of how things worked based on the paradigm of an information society. Its a challenging topic and difficult to pin down. This means I have had to explore issues over a wide range of policy areas. 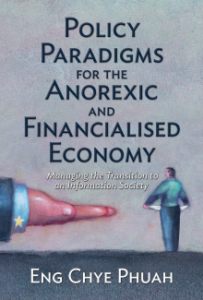 Over the next few months, I will cover the service economy, the sharing economy, household and work structures before moving onto policy issues on the anorexic economy (role of corporates, basic income, housing affordability) and the financialisation process (capital, monetary policy, securities regulation).